Sweater: Ily Couture twinning kids version here | Denim: Forever 21 | Heels: Jeffery Campbell similar here (half the price) | Sunglasses: Old similar here | Lipstick: MAC in "Ruby Woo" with this lipliner in "Cherry"
It's true, I really do heart (love) you all! It doesn't matter what holiday it is, I'm a sucker for the apparel and decor. I love ily couture's holiday collections. 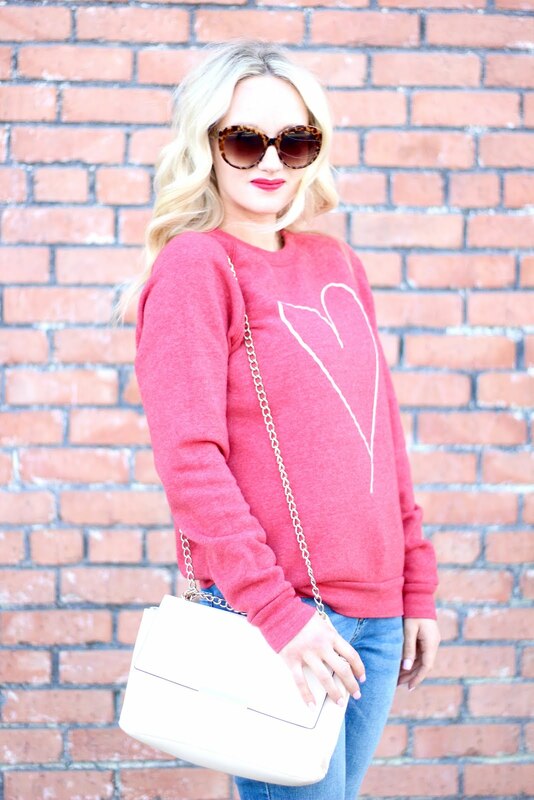 I have had this "Heart" Sweater for a few years and it is one of my favorites for V-day. There is even a twinning one for your mini (linked above and below in the widget). I love that you can wear it causal with some jeans, like I did here. Or dress it up with a skirt doing a half tuck and some heels. Also, I found dupes of my heels from Target!!! A fraction of the price and come in a ton of colors!